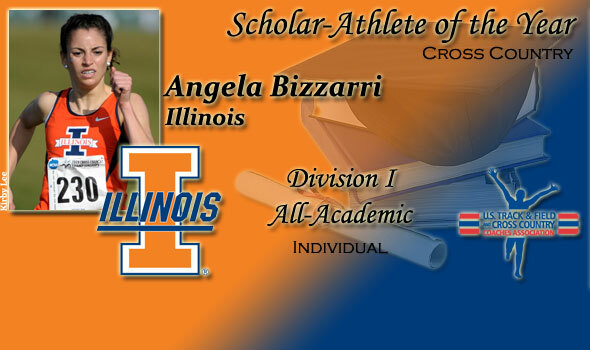 NEW ORLEANS – Angela Bizzarri of Illinois has been named as Division I’s female cross country Scholar-Athlete of the Year for the 2009 season as announced by the U.S. Track & Field and Cross Country Coaches Association (USTFCCCA) on Monday. Bizzarri is also among 104 given All-Academic status for the previous cross country season for their efforts in the classroom and on nation’s cross country courses. Bizzarri, a senior from Mason, Ohio, has a 3.62 cumulative GPA in the field of Molecular and Cellular Biology. The Scholar-Athlete of the Year award goes to the highest individual finisher from the previous year’s NCAA Cross Country Championship among those given USTFCCCA All-Academic status. In November, Bizzarri, the USTFCCCA National Cross Country Athlete of the Year, became the first women from Illinois to win the NCAA Division I cross country national title. Bizzarri set a new personal best on the LaVern Gibson national-championship course running 13 seconds better than she did at the 2008 championships. Bizzarri, also the USTFCCCA Midwest Region Athlete of the Year in 2009 earned her first regional title after finishing as the runner-up the previous three seasons at the Midwest Region meet. Bizzarri is joined by teammates Elizabeth Boyle and Kristin Sutherland as All-Academic honorees. The award honors those student-athletes who have succeeded both academically and athletically. To be eligible for the award a student-athlete must carry a minimum 3.25 cumulative grade point average and must finish among the top 15 finishers (or top 10 percent) of the field at their respective NCAA regional meet. The 104 USTFCCCA All-Academic honorees represent 57 schools around the country. Nine were reported to have 4.0 cumulative GPAs at the end of the 2009 fall semester, including: Courtney Calka of Eastern Michigan, Jessica Parry of Florida State, Anna Holm-Joergensen of Iona, Terry Phillips of Missouri State, Veronica Phil of Northern Arizona, Katherine Niehaus of Stanford, Winrose Karunde of Texas Tech, Kaitie Vanatta of Missouri, and Jordan Hasay of Oregon. The list also includes seven regional champions and three who finished in the nation’s top 10 at the NCAA Cross Country Championships. Syracuse and SMU both placed five on the All-Academic list with West Virginia and Villanova have the next most with four. The Big Ten, Big 12, and BIG EAST Conferences each had 15 representatives claim the honor. The male Scholar-Athlete of the Year in Division I is Northern Arizona’s David McNeill. Those institutions given All-Academic Team status will be named on Wednesday, March 3 (women) and Friday, March 5 (men).